Most master athletes we have met over the year’s exercise because they have to. They thrive on the hormone rush that follows, they thrive on the brain clearing effects of a walk/run through the trees. Over the last eight decades of treating athletes of all ages at Jewett Orthopaedic, it has become apparent that older athletes are just as driven as the younger superstars. They thrive on the thrill of a race, regardless of pace. They thrive on the way it makes them feel, and they will go to any length to protect their time on the road or the trail. Plainly stated, you have to make it to a certain age to become a master athlete. Sounds cruel, but it is true. A fast food lifestyle and diet are not likely to help you achieve that milestone. You cannot outrun, out-exercise or medicate away a bad diet. Fad diets are the rage, but typically do not lead to sustained lifestyle changes. Eating real food, less of it, and getting enough fiber in your diet to support your gut is clearly advantageous. Despite the banter in certain social circles — monitoring your LDL, homocysteine, uric acid, ALT and other basic biomarkers over time gives you a snapshot into how your dietary habits shape your risk for the development of chronic disease. The earlier in life that you focus on your diet and lifestyle, the more likely you are to have the ability to become a master athlete. During our more formative years, we laced up and ran outside. We didn’t worry about balance, strength, muscle tone and energy. As the athlete ages, these become very important issues to address proactively. Sarcopenia is the process of age-related muscle loss. Starting in our thirties we start to lose a percentage of our muscle mass each and every year. Muscle mass is not only critical to performance, but it has also been proven to predict longevity and a longer healthspan. Simply put, your healthspan is the number of years that you live relatively disease free, free of neurocognitive decline and free of a chronic disease burden which threatens your quality of life. Resistance exercise is a must for the aging athlete. A short well-balanced program consisting of calf exercises, squats, bridges, biceps curls, and shoulder exercises are critical to both reverse the changes of sarcopenia and maintain our current muscle mass. As we age our body has a harder time making enough protein to suit our needs. Our nutritional requirement for protein increases as we age. Unless you suffer from kidney disease, the average master athlete should be getting a minimum of 1.4-2 grams of protein per kilogram of body weight. A contemporary body of research shows that the timing of that protein intake isn’t critical. So you do not need to bring that protein shake with you to the gym or track. The effects of aging on the musculoskeletal system: Balance. As we age our ability to balance and stabilize ourselves diminishes. This is a far more serious problem than most people realize. While chronic disease sets us up for a diminished healthspan, injuries sustained as the result of a fall and the downtime to recover from those injuries significantly affect our health and longevity. Diminishing our fall risk starts with an active balance training program. These do not need to be elaborate gym based programs. There are plenty of balance exercises we can perform in the comfort of our home. Standing on one leg for 30 seconds can be challenging enough. When that becomes easy, perturb the system, start to move your arms around while one leg is raised. You will notice an improvement in your balance and control within a few weeks. Switch legs every minute. Carry small cans or 1 pound weights in your hands when body weight alone becomes too easy. You will feel more surefooted and confident after these exercises. Your fall risk will diminish with this program, and you will have diminished the risk of injury after a fall with your resistance exercise program. Simply put, the best exercise is the one that you will enjoy and continue pursuing because you enjoy it. Different exercises offer different benefits. Research shows that we only need to walk for 15-20 minutes a day to start to see the benefits of exercise. For many of us that might be enough. For others, it will not be. Many love to swim. Swimming provides an excellent combined aerobic and resistance-based exercise. You will maintain muscle mass, improve your heart function, lower your blood pressure, lower your cholesterol, and improve your glucose management with any aerobic exercise program. Cycling, as well as running, are also great exercise programs. They offer the same benefits of other aerobic exercises, but you will still need to work on balance and resistance exercises. “You should rest.” How many times have you heard that? From an orthopedic perspective, the term rest is a relative term. If you are used to running 30 miles/ week and something bothers you then “rest” might mean running on 10-15 miles per week. If you’re used to running 10-minute miles then you may need to run 12-minute miles. The same goes for resistance training. Absolute rest and ceasing all activities is almost never necessary. You will lose the aerobic or strength benefits of your training very rapidly. A few weeks of no activity and you are set back months in terms of the level you were training at. The concept of recovery is poorly understood. Have you noticed that the day after a particularly long walk, ride or jog your heart rate is a little higher, or perhaps you’re a little short of breath? Your body is telling you that it needs to have a lighter day. Recovery, just like rest, is a relative issue. If you rode your bike 40 miles the day before, then a recovery ride might only be 4 miles. If you jogged 5 miles, then a recovery day might be a 1-mile walk. At least one or two days a week you should let your body completely rest from resistance or pushing your aerobic thresholds. That doesn’t mean you can’t hike or take a walk. It simply means that you need to let your heart, and muscles recovery and repair themselves from your activity over the past week. Should I insist on an MRI? The answer to this question is almost always no. There are certain reasons to obtain an MRI, but it might surprise you to know that those reasons are not encountered often. As we age our joints and the internal structures such as our rotator cuff in our shoulder and our meniscus in our knee will also change with age. Virtually no one over the age of 45 has an MRI of the knee, shoulder or back that will be interpreted as being normal. That means that your MRI will show something is “torn”, or better put- worn out. And in all likelihood, whatever is on your MRI now was there before your knee or shoulder started hurting. It is very hard for many people to grasp this concept. Hopefully, my radiology colleagues will start to use the term “age-appropriate” change, as opposed to the term degenerative tear. That will lessen the emotional burden of thinking that something is torn inside your joint. The research on degenerative meniscus tears in the knee and degenerative rotator cuff tears in the shoulder shows that the vast majority of these will not require surgery. Most people (not all) will respond to a course of physiotherapy. No, exercise does not cause arthritis. 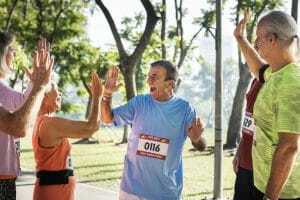 Quite the opposite, runners have a lower incidence of arthritis when compared to a matched group of less active peers. It turns out that your cartilage or the cushioning in your knees thrives on the cyclical loading of running. If you already have osteoarthritis or some degeneration in your knee then let pain be your guide. It may be best to cross train with swimming or cycling if your arthritis is advanced enough that running simply hurts too much to pursue. Is it OK to exercise with pain? This is a very important issue for the older athlete. Many of you will have discomfort with certain activities. More often than not you should not stop exercising. There are no over-use tendon issues that are treated with rest. Our tendons can start to bother us for many reasons, but stopping an exercise program is rarely in your best interest. Stopping your exercises will result in loss of heart health, loss of muscle mass, loss of endurance and often make it harder to get back into your exercise program. Aches and pains are often just a mild annoyance or nuisance. Exercise or physiotherapy is often the best way to address them. Again, rest is rarely the right answer. Now that comes with a caveat. If you think of a pain scale from 0-10, with 0 being no pain; if you have pain during activity and you would rate it under 4 then it is generally ok to continue exercising. By all means, if you have pain that concerns you, then you should see your practitioner. If you do choose to see a doctor, you must remember to ask if rest is necessary. If they say yes, then ask how long, and what are the potential downsides of not resting. For example, groin pain with certain exercises could potentially indicate a stress fracture of the hip. You should not exercise with a stress fracture of your hip. But groin pain can also be due to a muscle strain. As I said before, the best treatment for a muscle strain is to stretch and strengthen it. So do not be afraid to ask your doctor pointed questions about what they believe the source of your pain is, how are they going to prove it, and whether or not continuing to exercise puts you at risk of developing a more serious injury. In the end, the vast majority of senior athletes I see do not need to stop their exercises and frankly should not stop their exercises for mild aches and pains. You want to avoid potentially problematic issues like a stress fracture, but you never want the risk of the treatment to be higher than the risk of the injury. So take it upon yourself to ask what your doctor believes might be the cause of your pain. Have them clarify if any further tests are needed. Ask them if rest is absolutely needed. You will need a solid plan and goal if you aim to continue your exercise pursuits for years to come. Exercise is critical to achieving our best possible health. Speak with your doctor to be sure you can start an exercise program. Know your biomarkers. If something is off, ask what you can do to correct it. Age-related muscle loss can be corrected, but it requires resistance exercises. Balance training is critical to minimize the risk of falling. We do not need to MRI all joint aches and pains. Respect your bodies need to recover. Physical therapy is often effective at treating the pain associated with degenerative tears in your knee, shoulder, hip, and elbow. 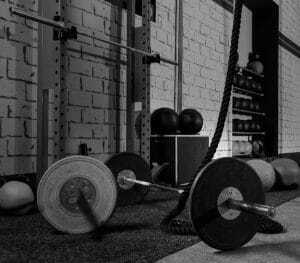 The best exercise is the one you enjoy doing.